back, by popular demand, the Grains in Your Life exhibit will be showcased at the Royal Agricultural Winter Fair in Toronto from November 4 to 13. Building on last year’s success, the exhibit will continue to showcase vignettes of a house constructed and decorated with grain bio-products, but in 2012 it will incorporate some fresh interactive elements to engage visitors in a different way. The impressive living room, kitchen and garage vignettes have been updated with new products including a La-Z-Boy recliner with EcoComfort™ soy fabric, corn based biodegradable containers and SoyClean sealants for wood and concrete. The rooms will also continue to display the crowd favourites – wheat straw particle board panels, a corn resin countertop and soy spray foam insulation – among many other bio-products. Fans of the exhibit might note a glaring absence – the office vignette. This space has been redesigned as a field of corn, soybean and wheat plants mimicking an actual farmscape. This small field plot will help visitors make a direct connection from field to furniture, or crop to countertop. hands-on experience. Students who have participated in the What’s Growing ON? classroom kit have been invited to bring their very own soybeans and wheat kernels that they grew at school and at home to process at the exhibit. 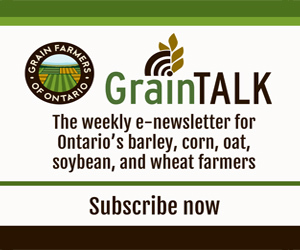 To further support the classroom kit, Grain Farmers of Ontario is proud to sponsor the grade four class from Gradedale Public School to visit the Royal Agricultural Winter Fair. Their wonderful teacher, Cheryl Agoston, has shown much enthusiasm for bringing agriculture to her urban classroom and is incorporating What’s Growing ON? into her curriculum.